So, I’m not someone who cooks very often so I haven’t tried to start cooking for my animals. However, most of the time when it is talked about, what to avoid isn’t mentioned. I recently found out garlic is not good for dogs (I use a lot of garlic when I cook meat), so I really shouldn’t be giving my animals even the little pieces of the meat I cook. Is there other things/foods that should be avoided? I know about a few but not many. Also, I give me dog beef marrow bones raw from the grocery store for chewing a couple of times a week. I’ve recently become concerned about the marrow bones though because even though they haven’t expired yet and they have been kept refrigerated or frozen as directed, they start to stink. I wouldn’t normally eat or cook food that started to smell at all. The dog still seems to like it and hasn’t gotten sick from it. Is that a normal thing for marrow bones? Should I be throwing it away instead of giving it to her? Sorry for the long post but any discussions on these topics would be appreciated. 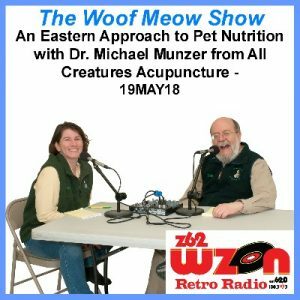 FYI…I listen to your podcast and I’m really glad you are providing the info that you do for us pet owners. Thank you for your post and thank you for listening to The Woof Meow Show. If you search Google for “What foods are bad for dogs” you will find a variety of lists and they are not all the same. Some even list things such as “raw meat” and “raw eggs” which many people, myself included, feed their dogs. In that case, it depends on the quality of what you are feeding. While onions and onion products are a “no, no” garlic is used in many pet foods and pet supplements. My point is the information that is out there is not exactly black and white. The list below indicates what most everyone agrees on. If you decide to feed your dog I recommend you follow the recipes in one of the many books on the subject. My favorite is “Natural Nutrition for Dogs and Cats – The Ultimate Diet” by Kymythy Schultz. She has been a past guest of The Woof Meow Show talking about making food for your cat. As for bones, it depends on how they are processed and stored. I suspect that bones from the grocery store are a waste product of their meat department. Waste is not always treated as if it will be consumed, so it may not be adequately refrigerated at all steps in the process. Many raw pet food companies also sell bones, which are processed as if they are food and are refrigerated throughout the process. We sell bones from these companies in our store and many dogs love them. I’ve never had a stinky one. Thank you again for writing and listening to the show!